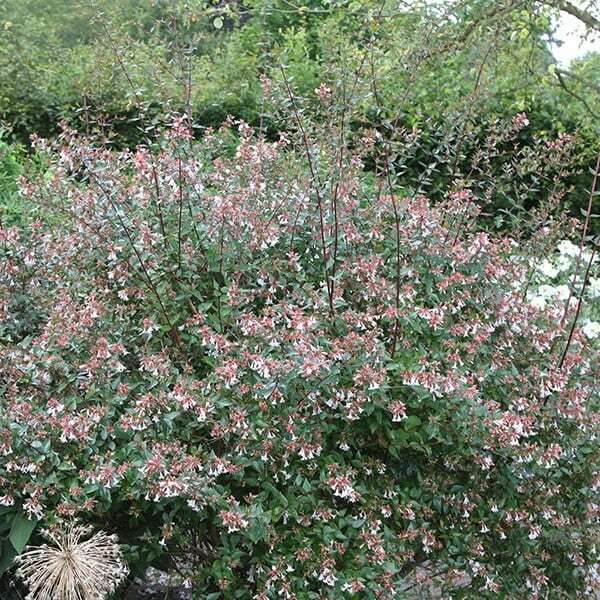 A useful, long-flowering, semi-evergreen shrub for a mixed border. 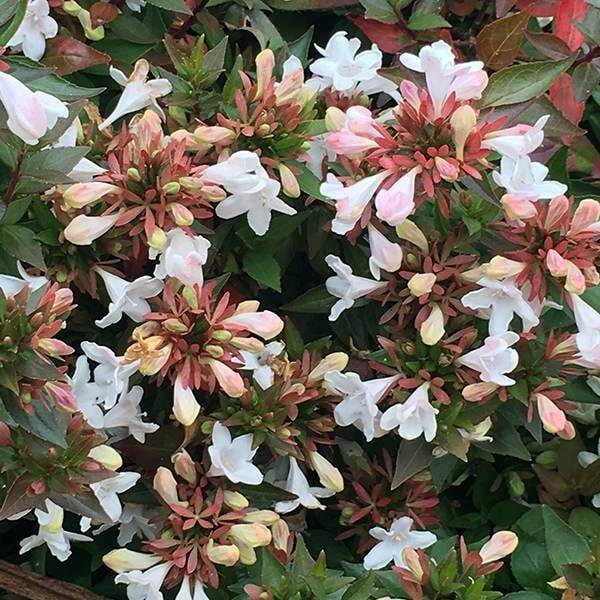 This abelia has attractive, glossy, deep green leaves which it hangs on to for most of the year. From June, it produces masses of small, fragrant, pink-flushed, trumpet-like flowers on arching branches that go on all summer. As it’s slightly tender, it’s best grown in the shelter of a wall, towards the back of a border. Ideal for a cottage-style garden. Garden care: Deadhead regularly to prolong flowering. 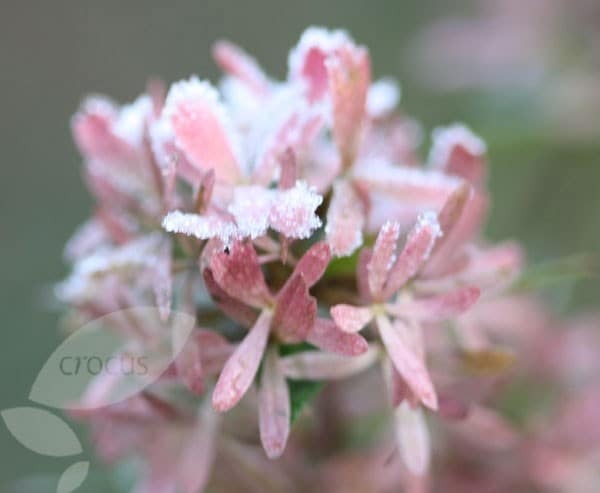 In autumn after flowering, lightly trim back the flowered shoots to retaina neat and tidy shape. Remove any dead or damaged wood in April. A good healthy plant that is growing very well. I bought this plant because it is evergreen, has fragrant flowers and will fill a big space in my border. I planted it as soon as it arrived. It was small to begin with but once the spring and summer arrived it put on a lot of growth. I kept pinching it out to encourage a busy growth as some stems were getting leggy. It has begun to fill the bed quite nicely and the flowers have a lovely fragrance. I am expecting it to double in size this year. This plant is a replacement for one of a pair either side of a set of steps. One disappointingly died back suddenly, maybe due to a rather colder windy position. The original shrubs were not bought from you so I am hoping that this new healthy plant you have supplied will be a happy partner to the first! the plant is doing very well and I am pleased with it . Really pretty plant occupying a sheltered sunny spot in the back garden . I do not have a nickname . This is a pretty shrub that has grown well in its first year. It is easy to keep to a reasonable size in my town garden. Hello, I want to use this plant to border a pathway but I wouldn't want it it get too big. Is it possible to keep cutting back each year to keep the plant quite small? I was also looking at eleagnus and wondered the same question. Thank you. Hello there Abelia × grandiflora will grow in acid, neutral or alkaline soil. Hope this helps.